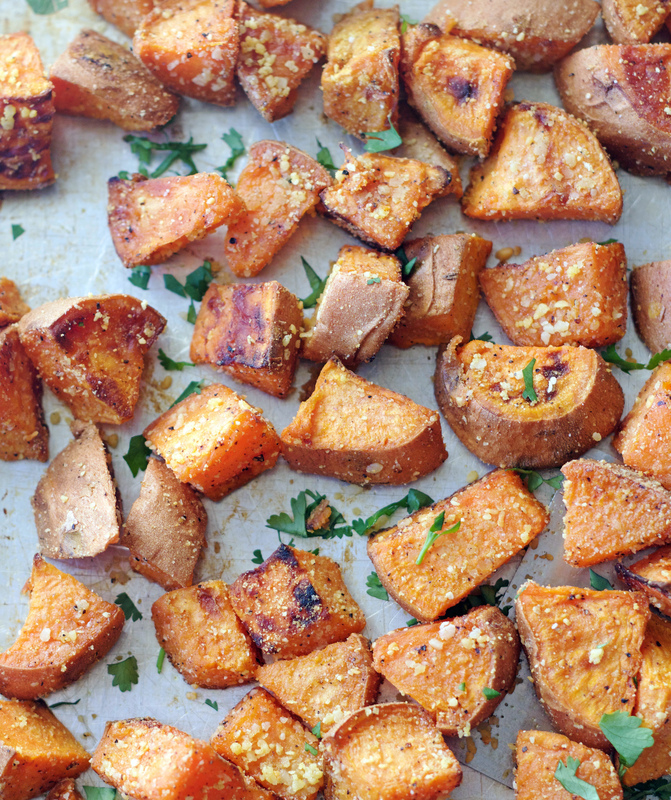 Chunks of sweet potato are roasted and then dusted with Parmesan and a hint of garlic, these Parmesan Garlic Sweet Potatoes are so spectacular! A simple, stunning and delicious dish. When anyone raves to me about a new recipe they’ve tried, I can guarantee that I’ll have made it within a day or two of hearing about it. 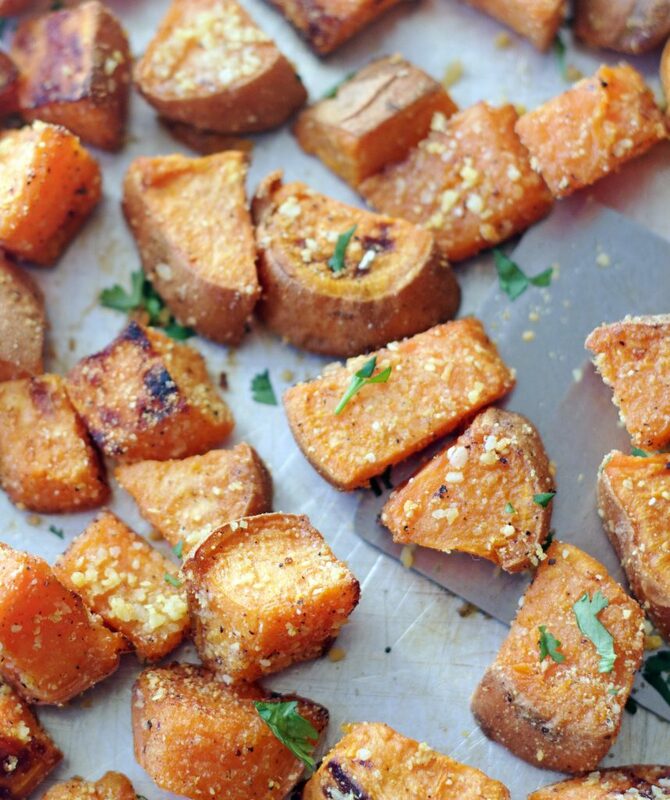 My sister told me about these Parmesan Garlic Sweet Potatoes and went on and on about how amazing they are. She had her son, who doesn’t even like sweet potatoes, taste one and he couldn’t stop eating them. So I made them and I literally wanted to snarf up the entire pan all by myself. Truth be told, I could have and no one would have even known because I made them several hours before dinner so I’d have good lighting for pictures. The only one home was our dog Buddy, and unless he smells peanut butter toast, he’s usually sleeping in front of whatever window the sun is beating down on. You guys, these potatoes are so crazy good. I could eat them every.single.night. If you’re wanting to add a simple & fabulous new side dish to your recipe collection, this is one you absolutely need! In a large bowl, place the potatoes, oil, salt, and pepper and toss to combine. Transfer the potatoes to a rimmed baking sheet and spread into a single layer. Roast for 15 minutes, then using a spatula, flip the potatoes over and cook until browned and tender, about 10 minutes more. Remove the baking sheet from the oven. Set the oven to broil. Sprinkle the potatoes with the garlic and half of the cheese and stir to coat well. Sprinkle the remaining cheese over the potatoes. Broil until the cheese is soft and melted, 1 to 2 minutes. I usually sprinkle garlic powder over the potatoes in place of the minced garlic. I use about 1/4-1/2 teaspoon. I think it covers all the potatoes better vs. the minced garlic. Feel free to do it either way. You want to make sure you use finely grated Parmesan cheese. The stuff in the green can works great, but if you decide to grate your own, just make sure you use the smallest holes on your cheese grater. These have become our “go to” side dish! They are simply delicious!! Thanks for telling me about this sis! These look fabulous!! Do you peel the potatoes first? Hi Brittany! You don’t need to peel the sweet potatoes first, I’ll add that in the post. Hope you have a chance to make them. So I made these the Sunday before last. I knew I was going to love them. Before I could get the leftovers put away, Ty had eaten the rest! Making them again for sure! Thanks Jana! They’re my new favorite and I’m so happy you guys loved them. Ty is a smart kid!! Hi Brittany, these are definitely on the softer side. Some of the edges do get a little bit crispy. Even if you’re hoping for all crispy, I hope you try these. They are so delicious. Ever since I told my mom about them, she makes them all the time. She can’t get enough of them.